If you currently rent an instrument from Leonards Music and are in need of a repair: Please contact us via phone or by email. We complete all of our rental repairs within 24 hours. A mainstay of our business has always been the ability to provide expert repairs to the professional and student music community. Instruments can be dropped off at our shop at anytime without an appointment during our regular business hours. 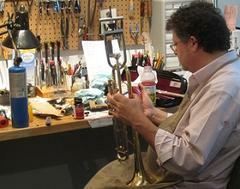 A technician will evaluate your instrument and we will call you withing 2 business days with an estimate. You can also make an appointment to meet with a technician for an immediate estimate. Please contact the office via phone or email if you would like to schedule an appointment.